David Hayes is one of America's premier sculptors. The Florida Gulf Coast Art Center is proud to have brought this exciting screen sculpture exhibition to our state to initiate the Florida tour. Educated at the University of Notre Dame, Hayes had the fortuitous opportunity to work with American master David Smith while completing his M.F.A. at Indiana University. While his uvre is inþuenced and informed by his experience, he has clearly established his place in American sculpture, primarily through innovative welded steel constructions. As a 1961 Fulbright Scholar, Hayes had the opportunity to study in Paris, and subsequently, grants from the Guggenheim Foundation and the National Society of Arts and Letters afforded him the further opportunity to live and work in Europe, exploring a variety of mediums. However, his first and lasting love is manipulating and fabricating steel with the welder's torch. His work has been shown in more than seventy exhibitions here and abroad, and is held in major museum and private collections, including the Museum of Modern Art, the Guggenheim Museum and the National Museum of American Art, among others. Begun in the mid-seventies, the screen series has maintained David Hayes' interest for two decades. While he has created numerous other pieces, he has maintained his fascination with this evolving body of work. Through careful dissection of vertical planes, Hayes has explored a format with endless possibilities, evoking light to become an integral element of the object. Painted þat black, these welded steel screens present an ever changing visual experience for the viewer through the use of negative space, in short ­ the presence of absence. 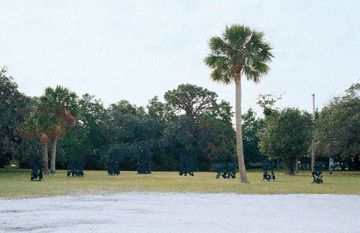 For several months, eight of Hayes' screen sculptures, in varying sizes, have graced the grounds of Florida Gulf Coast Art Center. I have had ample opportunity to observe the public interacting with the work. The quality of Florida's intense and changing light has form, space, and illumination, drawing the visitor in and out, around and through the installation. Ever changing, ever intriguing, always new. It is our hope that the citizens of Florida who have occasions to see this installation will have an equally rewarding experience as those adults and children who have visited the Florida Gulf Coast Art Center's sculpture park during the past few months. Sculpture exists in our space. Among the traditional art forms ­ painting, sculpture, and graphic arts ­ it is the most three-dimensionally insistent, and only architecture has a comparable concern for tangible solids and voids. Sculpture can be two-dimensional or three-dimensional; it can emphasize solids or voids; it can turn inward on itself or outward to the surrounding world; it can be infinitely complex and yet simple to comprehend. Of course, no piece of sculpture embodies all of these qualities ­ their very contradictoriness precludes that ­ but these qualities do suggest the uniqueness of sculpture as an art form and they are ways in which we can talk about the screen sculptures of David Hayes. David Hayes' screen sculptures have occupied him intermittently since the middle 1970s, and in developing this genre of sculpture, he has exploited the ambiguities that the idea of a screen implies. Some of the sculptures work best against a wall that reinforces the two-dimensional nature of the screen; others stand out three-dimensionally, independent of a ground but in their mass literally screening out the view beyond. What both types share is a self-contained completeness. What they block from view, whether a wall or a vista, is of no particular importance; only the sculpture is significant. One does not care what lies behind because the "screen" is not a door to anything else, only to itself. Complementing this idea of the self-contained work, the screen sculptures tend to turn inward and remain spatially discreet. In spite of their broken outline, the sculpture does not so much project into the surrounding space as pull space into it. The interplay of solid and void creates a rhythm of ascending and descending lights and darks, open and closed shapes. These spaces within the work give the whole transparency, and the changing light of the times of day or seasons of the year alters the shadows cast within the work. Because visual þux is inherent in the screen sculpture, the sculpture might seem to recreate itself over time. The patterns are never static because the hardness of the solids is continually neutralized by the malleable voids and eroding light. This quality imparts a fragility to the sculpture; a sensation of tumbling shapes arrested for an instant, their edges haphazardly touching, like leaves falling on the wind. Are these works complex? Certainly, as all aesthetically satisfying objects are. But they are also immediately engaging as formal, visual issues of shape, space, light, and composition. They are abstract but tangible; multifaceted but limpid. They have no commentary but their art. The pieces in this exhibition are from my Screen Sculpture series, begun in 1976 and continuing. They were selected not only for their relationship to the site but for their compatibility with one another. Several of my most recent works are represented, with earlier pieces establishing a continuity. The interplay between solid and void attracts me, and the vocabulary of forms that comprise the sculptures is enriched daily by discoveries that I find in nature. The selection of natural forms, the positioning of those forms in relation to each other and to their voids are what make the Screen Sculpture series an ongoing challenge for me. Screen Sculpture # 26, 1987: 121" x 71" x 36"
Screen Sculpture # 58, 1994: 81H" x 52H" x 22"
Screen Sculpture # 63, 1994: 60" x 55" x 24"
Screen Sculpture # 67, 1995: 60H" x 31" x 21"
Screen Sculpture # 68, 1995: 55" x 36H" x 14"
Screen Sculpture # 69, 1995: 65H" x 40" x 19"
Screen Sculpture # 75, 1995: 84" x 45" x 20"
David Hayes was born in Hartford, Connecticut and received an A.B. degree from the University of Notre Dame in 1953 and a M.F.A. degree from Indiana University, where he studied with David Smith in 1955. He has received a post-doctoral Fulbright award, a Guggenheim Fellowship, and a grant from the National Institute of Arts and Letters. He has been appointed Visiting Artist at the Carpenter Art Center, Harvard University; and has represented the United States at the Forma Viva sculpture symposium in Portoroz, Yugoslavia. He has served three years on the National Screening Committee for the Fulbright-Hays awards in sculpture, and was the subject of a documentary film in 1991 on Connecticut Public Television. Hayes has served as a Regent at the University of Hartford, and is a board member of Sculptors Guild in New York. He resides in Coventry, Connecticut.